In the mid 1920s, along with Dot Merrick, Mabel started a womens section of VAWC. It was called the Victorian Womens Walking Club and provided an means of allowing women to officially racewalk. Then Mabel Moad, she was a perfect stylist and was generally rated up there with Tom Daintry as the fairest proponent of the sport in Australia. She won many Australian and Victorian titles. In 1929, she was one of the women who formed VWAAA and started womens athletics in Victoria. Alf was one of the driving forces working alongside her in this endeavour. She was a finish judge, recorder, field judge and track and field referee. She was Vice-President of the VWAAA from 1932- 1948 and became President in 1952, a position she held until 1978. She was appointed a Life Member of the VWAAA in 1948. During the early days of the VWAAA, she continued to race and won the inaugural 1933 AWAAU 880 yards championship. She was also a State selector between 1954 and 1958 and managed the Victorian women’s team to the AWAAU nationals in Perth 1954. At a National level Mabel became Vice-President of the AWAAU between 1950-1962 and in 1962 she became President until 1978 when the men’s and women’s Unions amalgamated. She then became Vice-President of the newly amalgamated Union (now Athletics Australia) until 1983. She joined the Victorian Athletic Association office in 1955 to assist in the organisation of the 1956 Olympic Games and remained for 27 years. She was appointed Assistant Manager of the 1958 Commonwealth Games Team (Bert Gardiner was the Manager). In 1971 she received a Merit Award and in 1973 was awarded life membership of Athletics Australia. Mabel also received an MBE for services to athletics. 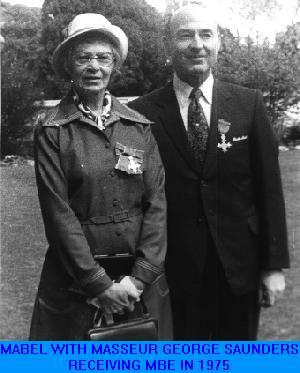 She was awarded her life membership of VAWC in 1978. At that time, she was still Secretary of VAAA but still found time to work alongside Elsie Jacobson in the club on the Social Committee. After she retired from the VAAA office, she was enticed to the 'Athletics Australia' office by Ric Pannell and worked there for many years. She eventually retired in the 90’s and died in 2000. Her contribution to athletics spanned over 70 years, first as an outstanding athlete and then as an equally outstanding administrator. The Mabel Robinson Memorial Trophy is awarded annually to the winner of the VRWC Open Womens 10 km championship.